Why does the Apostle Peter compare Bible prophecy to a bright light? 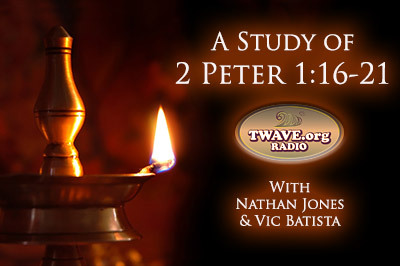 In this "The Truth Will Set You Free" TWave Radio episode, Pastor Vic Batista of Miami's Calvary Chapel Aventura and I will embark on a study of the Apostle Peter's message in 2 Peter 1:16-21. "And so we have the prophetic word confirmed, which you do well to heed as a light that shines in a dark place, until the day dawns and the morning star rises in your hearts; knowing this first, that no prophecy of Scripture is of any private interpretation, for prophecy never came by the will of man, but holy men of God spoke as they were moved by the Holy Spirit." Vic Batista: Here we learn that Bible prophecy is supposed to be like a light in a dark place. Nathan Jones: True, God's prophetic Word is a light shining in a dark place. When you are driving down a dark tunnel and you can't see the end of it, you have to turn on your car's headlights to see a few more feet down the road so as not to crash in the walls. That is what Bible prophecy is like. We go through life like we are traveling down a dark tunnel. We don't know what the future has in store for us, but the Word of God lights our path. The Bible shines ahead of us so that we know that when we get to the end there is going to be a gloriously bright light, and that is the light of our eternal life with Jesus Christ. Vic Batista: Light exposes. It brings clarity and truth. It exposes the false teachings from the true teachings. Nathan Jones: Having the light of the Word of God is very important in one's life, because Satan tries to drown out the impact of the message of God in our spiritual walk. Satan has been trying to drown out God's message since the Church was first created. The Devil seeks to drown out the message of the Word of God with so many other messages so that people give up trying to find the truth. But, in this verse Peter is saying, "We've got the truth. We were there with Jesus. We saw what He did firsthand. We are willing to die for that belief." Now 2,000 years later, we are still sharing that truth as the Good News continues to be passed from one believer on to the next. And when we accept Jesus as Savior, the Holy Spirit comes in us and lights this dark world. Vic Batista: Light brings clarity. In Matthew 5 we are told that we are to be the light of the world and the salt of the earth. That means we need to shine our light and act as preservative agents. Nathan Jones: Frequently throughout the Bible the world is compared to a dark place because people live in darkness due to our sins. As Christians we are the light of the world. But, the world wants to stay in the darkness in order to hide their sins. Therefore, they are always trying to snuff the light out. But, we as Christians need to be that light and shine as bright as possible in order to chase the darkness away so that people can see the truth of Jesus Christ. We as Christians are also supposed to be like salt. Salt is a preservative. Let's say you salt some meat. Inevitably the meat will become corrupted and decompose, but salt preserves it longer than if it wasn't salted. While we are in this fallen world, we preserve the world a little longer until Jesus Christ finally comes back to renew it. That is the Christian's purpose while here on this earth. Vic Batista: God's prophetic word also shines in the darkness. So, Nathan, why then are there so few pastors shining the light of Bible prophecy? It seems that instead of shining it brighter, the batteries are going out. What's going on? Nathan Jones: The big push to study Bible prophecy definitely reemerged in the 70's and 80's. Why then did the passion for prophecy start dying out? I think it is because after Hal Lindsey came out with his book, The Late Great Planet Earth, and got everyone excited about being in the season of the Lord's return and showed us the signs of the end times that prove that we are in the last days, it didn't happen as quickly as people wanted. People are impatient. When we hear "soon return of Jesus" we are expecting an hour from now, or next week, but then years went by and they gave up. When Jesus doesn't return as fast as some expect, these people start compromising the Word of God to cover over the fact that Jesus isn't back yet. They come up with all these other theories about Jesus' return, or they give up altogether and begin spiritualizing the Scriptures. As a result, there are so many mixed messages being put out there that when Pastors and other people get to Bible prophecy they just can't make heads or tails of it. There is just too much confusion about prophecy, so they give up on it. When we give up on Bible prophecy, we are giving up on the light that shines ahead so that we can know the future. We lose out on that hope which gives us purpose and a destination. I believe churches are really suffering today from that loss as they are becoming more concerned about daily living and how to fix all of the problems in life, instead of looking at the big picture, which is Jesus Christ's Kingdom coming. Vic Batista: Regardless of our expectations, the Lord is coming, for He's promised, and His promises are always true. We should not get discouraged when God doesn't meet our own timing, but be encouraged by the fact that He will return as promised. There are still many who are preaching the Good News, and will continue to do so to encourage others. So, continue to rise up and become that individual who studies Bible prophecy. Proclaim it faithfully and powerfully, because we do know that the Lord is returning. How true that we are living in a day and age of compromise and where people are impatient. That is why I'm saddened by these movies that are portraying Blood Moons and hyper-sensationalist, extra-biblical prophecies. When nothing happens to fulfill these fake prophecies, people are yet again like, "See, I knew Jesus wasn't coming back." Nathan Jones: Sensationalist, extra-biblical prophecies are what makes the students of Bible prophecy look crazy. I had a pastor once say from the pulpit, "Going to a Bible prophecy conference is like going to a Star Trek convention." In other words, Bible prophecy isn't cool. It isn't happening. It's not hip. All the weirdos study Bible prophecy. One of my own good friends who actually likes Bible prophecy declared, "So many of those Bible prophecy guys are such weirdos when they come up with these crazy, sensationalist ideas." And, he's right. People do come up with all sorts of crazy things like Blood Moons, the Mayan Calendar, Y2K and all this other extra-biblical nonsense. Some even set dates for the end of the world, which have always been proven wrong one after another. The result is that these men thoroughly discredit the Word of God. They might be Christians who love the Lord and think they are doing the right thing by setting dates, but in reality they are discrediting God's Word and ruining people's faith in God and the Bible. That's why I believe churches are totally steering away from and not teaching Bible prophecy. They are not going to teach sensationalist predictions, and I agree with them. How sad! We've got to filter out all the crazy stuff and just get back into the Bible. The Bible is where truth is at. Forget all the sensationalist nonsense from people who are unwittingly or not trying to ruin the message of God. Just go back to the Bible and you can be sure. Vic Batista: The problem is that when we start to make up our own interpretations of the Bible, that is going to result in discrediting the Word of God. But, if we stick to what the Bible says literally, then we won't have those issues. In the sixth and last segment of our study of 2 Peter 1:16-21, we'll look at the Bible's claim at being the genuine, inspired word of God.